We manufacturer and supply Fashion Hobo Bags. These are available in various specifications that meet the individual requirement of our clients in the best possible manner. Vintage Hobo Bags is Pirate Black Tropicana Kantha Hand Bag Embroidered Decorative Tote Bag is provided to you at a very reasonable rate straight from the artisan’s workshop. Moreover you do not have to pay for any shipping charges. 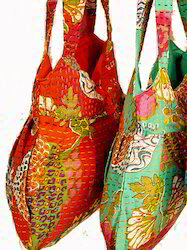 Old Kantha Quilt Bag is beautiful Cotton Kantha Traditional Hand Bag has a sturdy leather bag handle for a firm grip. With a spacious grip one can use it as a sling bag also. There is soft cotton lining inside the bag which has a purse pocket for keys or mobile. It also has magnetic buttons for quick snap and clasp. With the magnetic buttons on the 2 sides of the bag one can change the size of the bag to make it big or small according to the requirements. 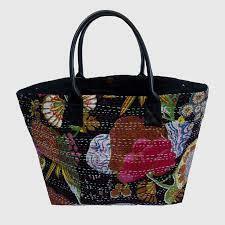 Kantha tote Bag is beautiful Cotton Kantha Traditional Hand Bag has a sturdy leather bag handle for a firm grip. With a spacious grip one can use it as a sling bag also. There is soft cotton lining inside the bag which has a purse pocket for keys or mobile. It also has magnetic buttons for quick snap and clasp. With the magnetic buttons on the 2 sides of the bag one can change the size of the bag to make it big or small according to the requirements. 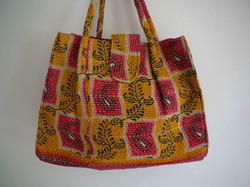 is beautiful Cotton Kantha Traditional Hand Bag has a sturdy leather bag handle for a firm grip. With a spacious grip one can use it as a sling bag also. There is soft cotton lining inside the bag which has a purse pocket for keys or mobile. It also has magnetic buttons for quick snap and clasp. With the magnetic buttons on the 2 sides of the bag one can change the size of the bag to make it big or small according to the requirements. The Vintage Kantha Bag Sling Cross Body Bag with glittery and sparkly Design handcrafted in India. These Brand New Shoulder Bags are made from Multi Cotton Hand Kantha Patch Work and inside cotton fabric. Bags closes with Cotton Straps and it has a pocket inside for Cell Phones.